Saturdays are special at Red Stick Farmers Market! | Oh, the Places We See . . .
Saturdays are special at Red Stick Farmers Market! It’s no secret that farmers markets are booming in urban and suburban locations all over the country. The farm-to-table concept is alive and well everywhere especially during the bountiful summer months. And so it was that while visiting my mom in Baton Rouge, I found myself downtown at the corner of 5th and Main between the hours of 8 AM and noon sampling goodies from the Red Stick Farmers Market and lovin’ it! 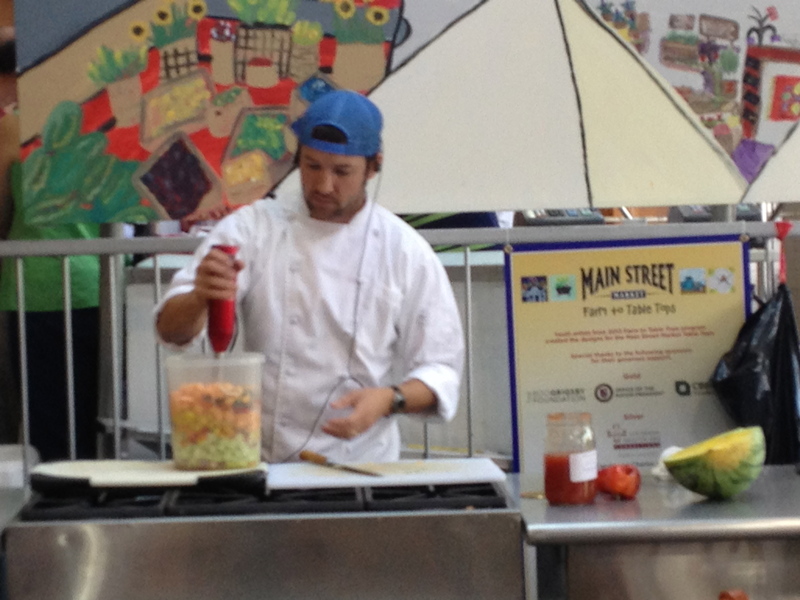 If you park in the adjacent Galvez Garage, you’ll walk directly inside to the Main Street Market where, on Saturdays, you can watch the Fresh from the Market Cooking Demonstrations beginning at 10. The chef on board this Saturday blended a mixture of fresh veggies and tomato juice for a healthy, colorful gazpacho while guests sipped coffee and sampled breakfast breads from Our Daily Bread right next to the cooking area. Loaves of fresh bread line the counter at Our Daily Bread. We meandered through the crowded aisle, past the demo and the tempting breads, so we could sample freshly made pork sausages neatly pinned by toothpicks and placed within reach at Cutrer’s. We can’t serve deer meat here, the vendor told me, but I was content with the delicious pork version offered to us. At Millitello’s Gourmet Specialties booth, we sampled fresh tilapia baked with Militello’s signature Sicilian Olive Oil with herbs and spices bottled right in. I had to bring home a bottle of this goodness after watching this gentleman offer us a second sample. First, he added a little balsamic vinegar, parmesan cheese, and granulated garlic to a tablespoon or two of the oil. Then he dipped french bread into the mix. Can’t wait to serve the fish or the dippin’ bread at home! 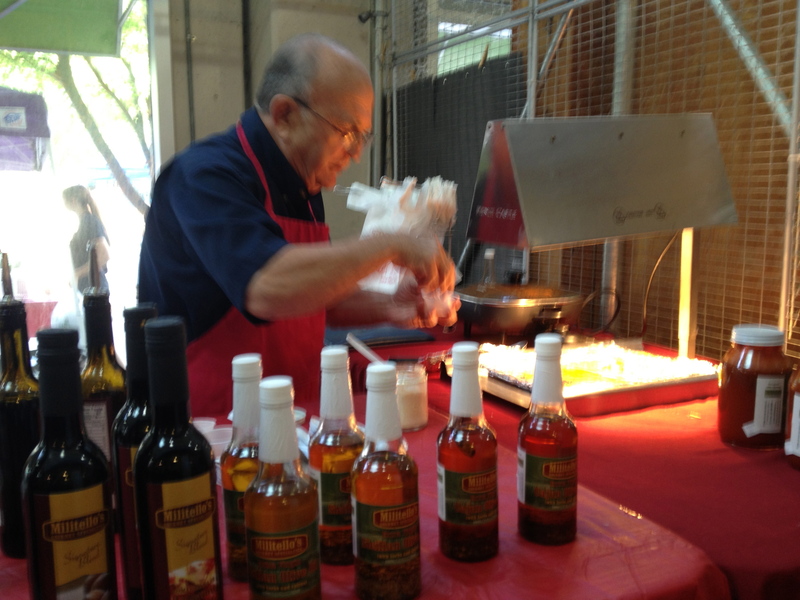 Fresh tilapia baked in Militello’s Sicilian Olive Oil was our treat from this booth. I passed on this gorgeous three-layer lemon cake only because I knew there was more temptation outside . . . and I was right. But you can buy one slice or one cake — your choice. Pretty cakes, right? 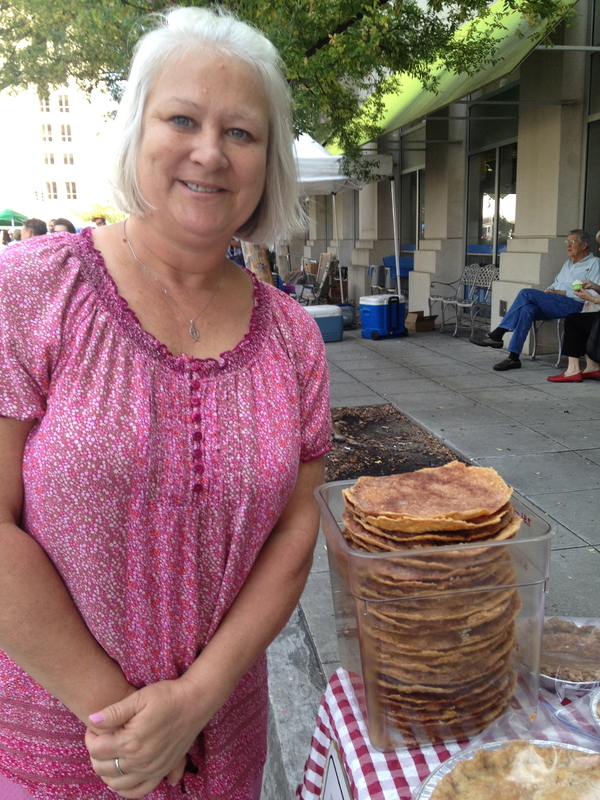 Outside, we met Frances Chauvin whose blue ribbon pies could have won recognition just for their looks alone. There’s nothing more Southern than homemade crusts filled with luscious coconut or pecan or fruit fillings, and these looked genuinely hand-crafted. When Francis told me she had just been to Knoxville this past spring to see Robin Roberts (anchor on ABC’s Good Morning America) inducted into the Women’s Basketball Hall of Fame, I asked her how she knew Robin. She worked for me when she attended college in Hammond where we’re located. Robin made $4.75 an hour when she worked for us, but even then I could tell she was going to be somebody. At the Hall of Fame, I spent an hour with her afterwards. I’m kind of a second mama, I guess. 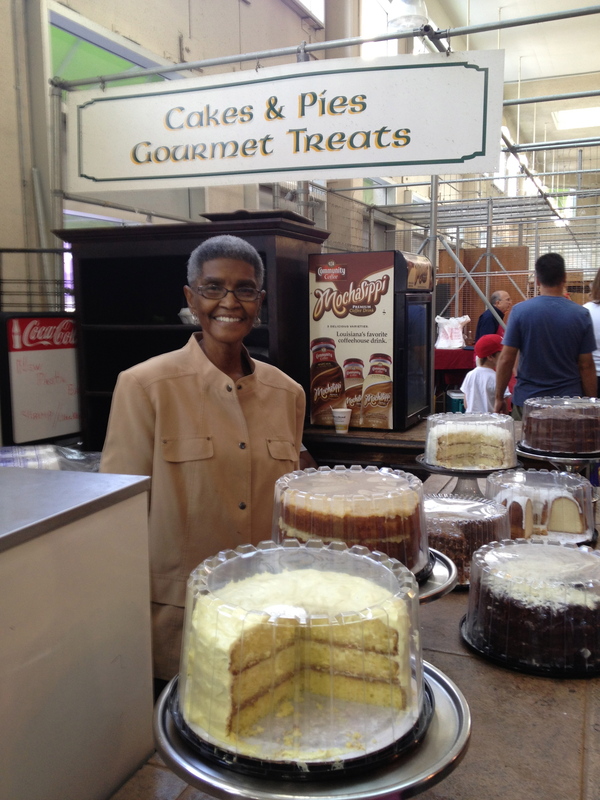 The story about Robin Roberts who worked with Ms. Chauvin held us captive, but the pies were what we took home. Some vendors brought goat cheese, some hauled in their greenest perennials, and some laid out their best summer vegetables like okra, potatoes, tomatoes, and lettuce. 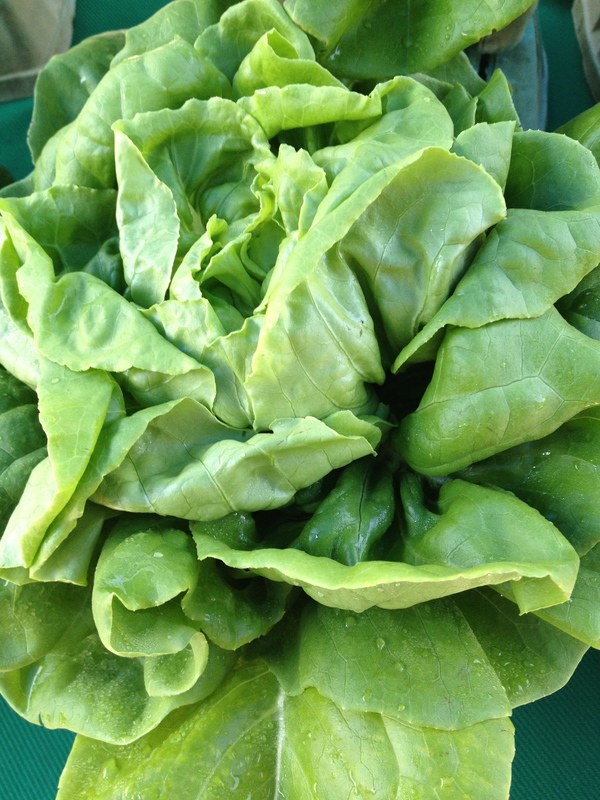 What do you think of this head of bibb lettuce that the vendor said was also called butter lettuce? I think it’s picture perfect! 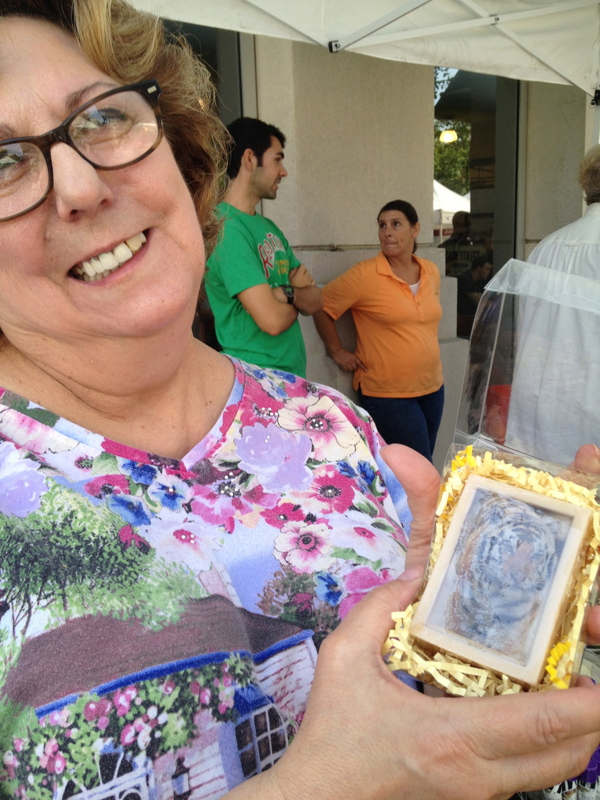 It’s a cake of soap with a tiger picture right on top! At the end of our journey, we wandered back inside only to be drawn to GoYaYa’s where they make crepes filled with sweet (Nutella, Strawberry, etc.) or savory fillings (Monte Cristo, Ratatouille, Muffaletta and more)! We split a Muffaletta Crepe, and, as you can see, this half of that delicious olive-laced concoction was plenty! 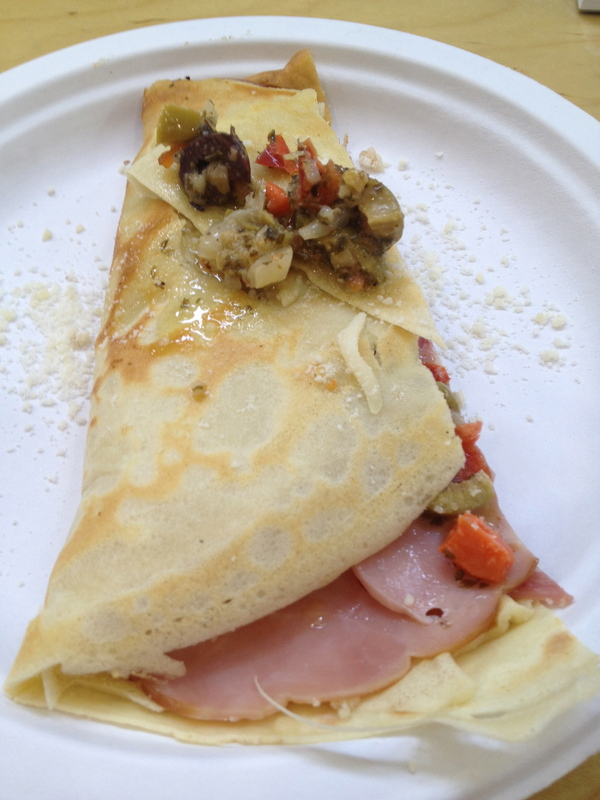 Half — yes, just half — of a Muffaletta Crepe from GoYaYa! 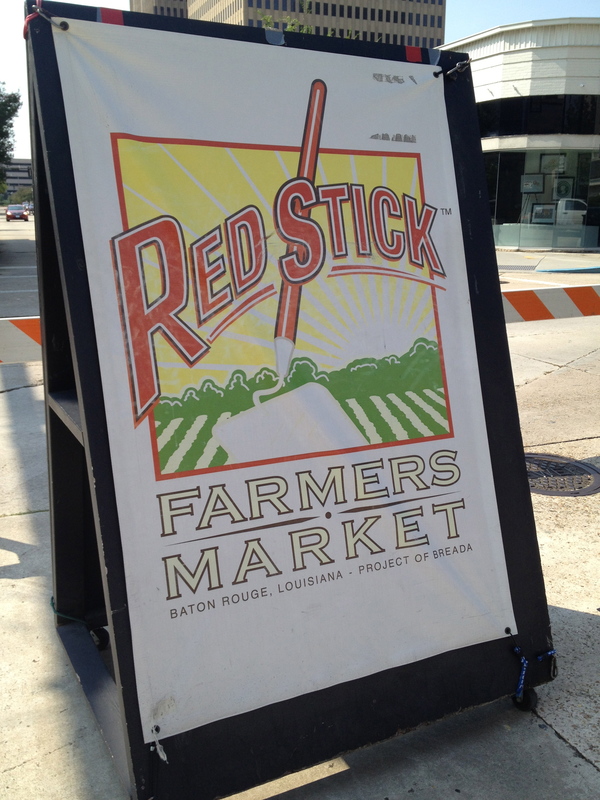 If you’re in Baton Rouge “of a Saturday mornin’,” stop by Red Stick Farmers Market, a place I first read about in a blog from Traveluster that you, too, can read here. And if you have a favorite farmers market of your own, let us hear from you in the Comments. Where should we go next to find the best veggies anywhere? 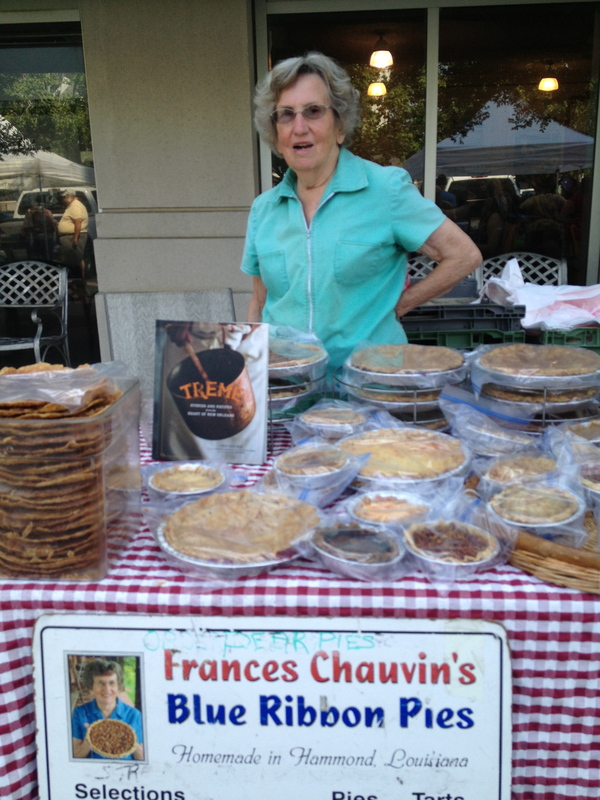 To read about the “Pie Lady,” Frances Chauvin, click here. This entry was posted in Farmers Market, Food, Louisiana, Restaurant, Retail Shops and tagged Baton Rouge, Bocage Honey, butter lettuce, Cutrer's, Frances Chauvin, GoYaYa's, Militello's, Red Stick Farmers Market, Robin Roberts, shoe soles. Bookmark the permalink. 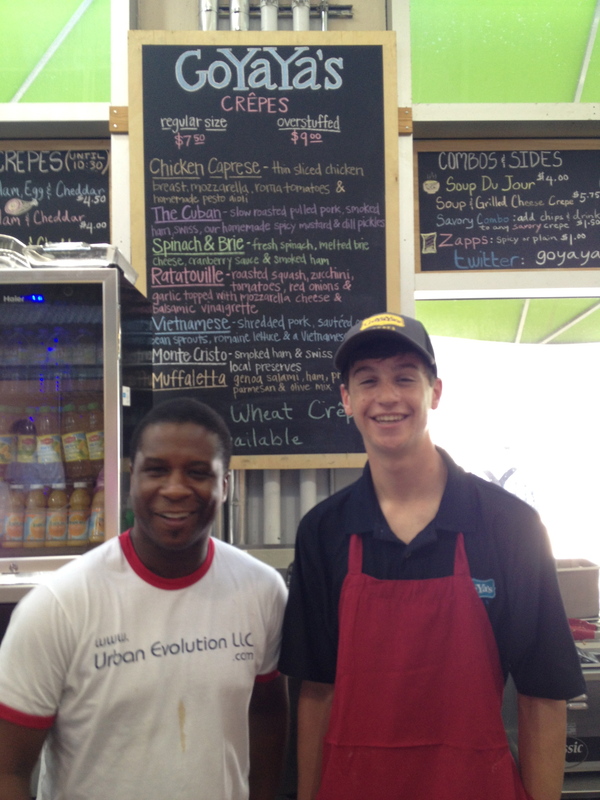 10 Responses to Saturdays are special at Red Stick Farmers Market! Pingback: Eat local, meet local at Boise’s Capital City Public Market | Oh, the Places We See . . .
Pingback: Eat local, meet local at Boise Farmers Market | Oh, the Places We See . . .
Rusha! I’m so glad you made it to the Red Stick Farmer’s Market! Isn’t it wonderful? I love all of the personalities! I adore Mrs. Frances! She’s the greatest! I loved the market and would return if given the opportunity. All the vendors were friendly sorts, willing to share their wares and offer up extra information, too. Hope I get back! Thanks for reading and commenting. Markets are fun now . . . not just trucks selling food out the back. I’m really enjoying finding new venues wherever we travel! It was a fun morning, and I’d do it again. Would love to see markets in your area, too! Thanks for reading!